Anyone who spends most of their day indoors knows the importance of a comfortable atmosphere to work and live in. Researchers from EPFL's Solar Energy and Building Physics Laboratory are searching for ways to maximize the energy gain from a building's envelope while also optimizing interior comfort in an environmentally friendly way. They are demonstrating how this can be done with "SolAce," the latest unit in Empa and Eawag's NEST research building. The blue-green facade of the "SolAce" unit at NEST shimmers like a butterfly's wing in the sunlight. 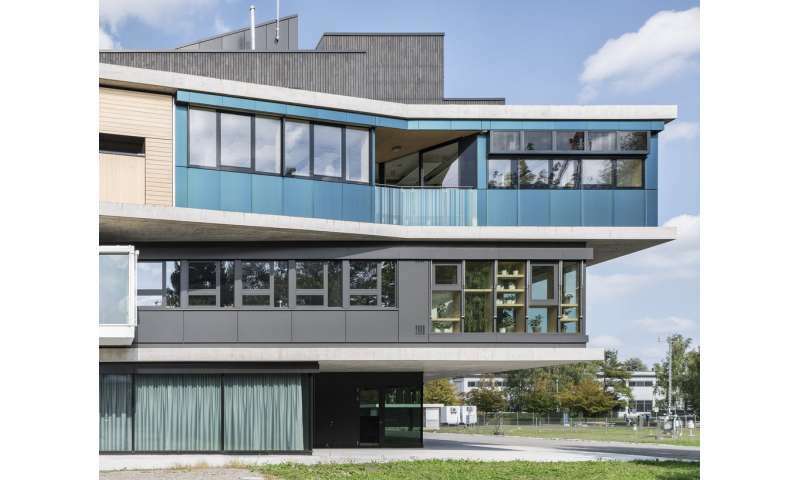 The latest addition to Empa and Eawag's research and innovation building in Dübendorf was officially opened on 24 September 2018. The unit combines workspace and living space over almost 100 square meters and is integrated in NEST's south-facing side between the second and third platform of the typecase-like structure. "Through its facade, "SolAce" is to harvest more energy than the unit needs over the course of the year, while at the same time providing the best possible comfort to the users." That's how Jean-Louis Scartezzini explains the objective of the project. The EPFL researcher is the Director of the Solar Energy and Building Physics Laboratory, and the idea for the latest NEST unit is his brainchild. To achieve this goal, the researchers combine several active and passive facade elements that feature technologies developed at the Lausanne-based lab. Some of those technologies are about to be commercialized by start-ups and collaborations with partners from industry, while others still have a way to go. "NEST gives us the unique opportunity to examine the various technologies in interaction with each other and in a real-life environment," says Scartezzini. The unit's positive energy balance is to be achieved by producing solar electricity and hot water directly on the facade. Photovoltaic modules and solar thermal collectors with a novel type of colored nano-glazing will be used for this purpose. 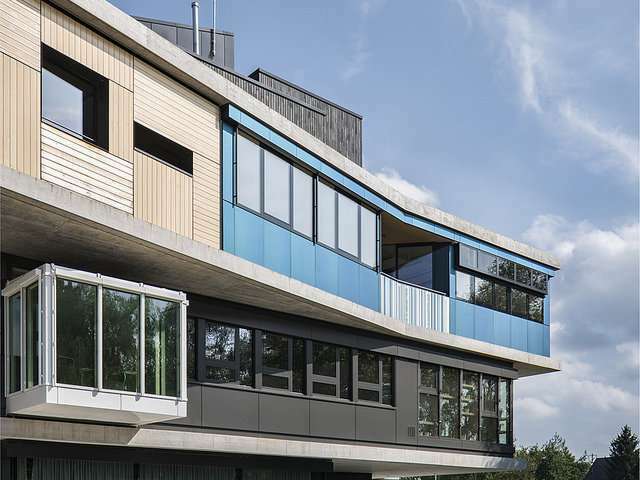 With the aim of promoting the integration of photovoltaic units in the building envelope by offering greater architectural scope through different colors, a team at EPFL has been researching coatings for coloration for almost 20 years. The research team, led by Andreas Schüler, was clear on the fact that the coating would need to cause as little energy loss as possible. There was no question of using absorbing color pigments. Instead, thin films of between 5 and 200 nanometers create what are referred to as 'interference color effects' on the interior of the glazing, not unlike those that appear on a soap bubble or on the wings of a butterfly for example. "Because the nano-coating is very transparent, there are virtually no absorption effects and just very minor energy losses," explains Schüler. This technology has now been patented and is currently being brought to market by the spin-off "SwissINSO," with the blue-green version being used in NEST. Besides office space for four people, "SolAce" also offers a living area for two. To keep the promise of optimum comfort, the researchers are attempting to recreate the users' individual perception by using innovative optical sensors. The prototype sensors measure lighting conditions and glare from a user's perspective, for instance a person working at a computer. This on-the-fly monitoring is used to control electric lighting and sun shading in the best possible way. It means that if a certain glare value is exceeded, the curved venetian blinds start directing the rays of light entering the building to the ceiling. Circadian lighting is also intended to boost the working performance of the "SolAce" inhabitants, but also to support them during recovery phases. Circadian lighting simulates the sunlight over the course of the day, thus promoting our natural sleep-wake rhythm. Likewise, innovative window panes are to contribute to a cozy atmosphere for living and working – and above all else to lower energy consumption for heating in winter and for ventilation in summer. Invisible to the human eye a micro-structured glazing in a polymer film on the interior of the glass directs wintertime light to the ceiling of the unit for even illumination, thus allowing the interior to heat up naturally. In summer, the same glazing ensures that the sun's rays are guided away from the windows and hence the rooms don't heat up that much. This new type of glazing was developed at EPFL by Andreas Schüler and his team. The researchers used a precision laser from Empa in Thun to manufacture the first prototypes. Now the team is working with BASF / Switzerland to develop an industrial manufacturing process. As soon as the first window panes are available, they are to be installed in the "SolAce" facade. Researchers from EPFL's Laboratory of Integrated Performance in Design will then measure the visual comfort of the new panes in situ. Until then, reference panes will be used that will provide benchmark figures. As is customary for NEST, the "SolAce" unit will be used and lived in on a real-life basis. During the first phase, it is primarily EPFL researchers who will use the rooms and monitor the systems and technologies and adjust them to ambient conditions. "Once this is done we will use the unit for our guests to work and to live in," says NEST Innovation Manager Rico Marchesi. He is delighted about the new addition to the research and innovation building and is convinced that "SolAce" can make a valuable contribution to the future design of building envelopes. "Thanks to the color glazing shown here, aesthetic concerns about the use of photovoltaic modules on the facade are clearly no longer valid," he is convinced. For Jean-Louis Scartezzini, the project is already a great success: "Again and again, the close cooperation between researchers and partners from industry, but also amongst the industry partners themselves, led to surprising ideas and a valuable exchange of knowledge." The architect of the unit, Fabrice Macherel from Lutz Architects in Fribourg, also found the collaboration between the realms of research and business to be hugely enriching: "Striking the balance between theory and practice was not always easy, but we learned a lot of new things and we can use this knowledge in future projects." To put it more briefly: technology transfer in its purest form.